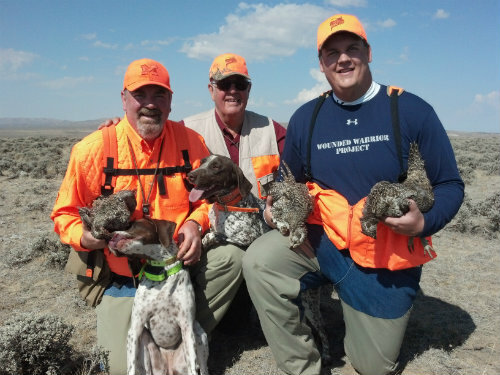 Wyoming’s Upland Bird Season for Hungarian Partridge and Chukar is open thru Jan. 31, 2014. 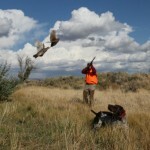 We offer guided hunts for Huns and Chukar now thru the end of the season. Our latest hunts have included some colder temps and a little snow, which is ideal for late season Huns! 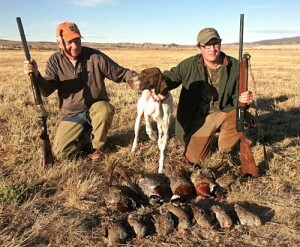 We are experiencing closer covey flushes and because we are hunting these birds a little less frequently now they are very shooter friendly…grab your dog or use our professionally trained pointers and get into some late winter bird hunting action, most day trip hunts are producing chances at limits of birds each day, which is 5 Huns and 5 Chukars a day. Call Jason or Judi at 307-267-2559 for bookings and lodging. Wow! Hard to believe bird season is upon us, 3 weeks to the opener for most of our bird hunts including Hungarian Partridge, Blue Grouse, Chukar, Pheasant, and Sharp Tail Grouse. If your intchin to get out and hunt with us give us a call and we can help plan your bird hunt. 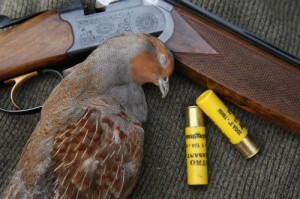 We have some great combination hunts/lodging for Huns and Blue Grouse, or Huns and Chukar. We also have some great Cast & Blast Options for a combination Fly Fishing and Bird Hunting Trip. Contact us for details and lodge availability. I just completed a pre-season project and got a new dog trailer modified and ready to start running dogs. I know my bird hunting guides are tired of guiding fishermen and really ready to get going on bird hunts. My pre-season routine will begin with light running of the dogs, 20 minutes per dog, for just the morning hours while its still cool enough. August has brought some much needed rain and overall temps have been pleasant, mid 80′s most days. Looking forward to September and cooler temps. These are the dates we have available for bird hunts Sept. 7-19, Oct. 3-16, 24-31, Nov. 1-4, 8-14, 18-25. Dec. open. Wyoming received average spring rains and during the first two weeks of June did not get any major hail storms so we should be seeing a good year for Upland Bird numbers across the state. Right now many areas are dry but this isn’t unusual for our area and I have been seeing many birds along the roads during my travels guiding fly fishermen. 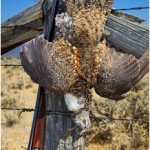 New Bird Hunting Website: We are launching a new website that is focused entirely on wingshooting for Upland and Waterfowl and the services we provide as an outfitter, the new website is www.wyomingbirdhunting.com and will be up and running by first week in July. We will let you know when we go live! 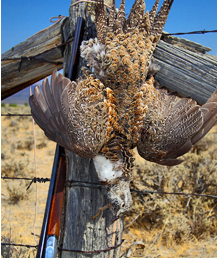 Fall 2013 Bookings: We are currently full for Sage Grouse Hunts except Sept. 27,28,29 we have room for 2 hunters left that’s it. Cast and Blast Trips start Sept. 1 and can be booked through the end of November, we have some openings for Cast and Blast just get with us on dates. Wild Huns are doing well and we are filling very fast for Oct, Nov Hungarian Partridge Hunts, get with us soon on dates and availability for these hard fast flying covey birds. Upland/Fly Fishing Combo Trip Packages start Sept. 1…Cast and Blast starts Sept. 1 we have availability the first half of September, second half of September for Cast and Blast is full. These high energy trips start off with world class upland bird hunting in the morning part of the day for Hungarian Partridge, Chukar, Blue Grouse, or Pheasant, then after a half day of Bird hunting you get to jump into a guided float trip on the North Platte River at Grey Reef, these are all inclusive packages $3250/person for 3 Days/4nights, for our corporate rates for parties exceeding 6 call Jason or Judi at 307-267-2559 or email us by clicking the contact button at the top. Get the latest issue of “Shooting Sportsman” and you will find a photo essay and short article featuring Grey Reef Wingshooting, guides Jesse, Ryan, and Jason all enjoyed pro-photographer Gary Kramer on this Upland Bird Hunting Photo Shoot called “Greater Grouse”. 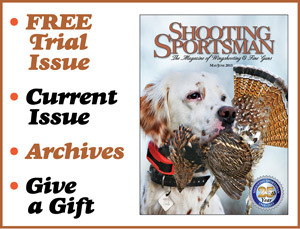 Click on the Shooting Sportsman Cover and go direct to get your free trial of Shooting Sportsman the Magazine. Our wild Partridge season ends Jan. 31 and the weather has been outstanding for upland bird hunting, temps in the mid 40′s, awesome numbers of birds and clients enjoying every bit of it! Guide Jesse McGregor reports back from the field after having a great day hunting Huns and Chukar, they even bumped into in a few pheasants for the dogs. Canada Goose Hunts…I just got back from guiding some goose hunters and the hunting was fantastic, we had 17 geese and could have shot more but the boys just about ran out of shells! 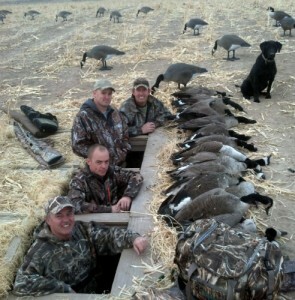 Canada Goose Hunts extend to Feb. 17th this season, get here and get some geese.